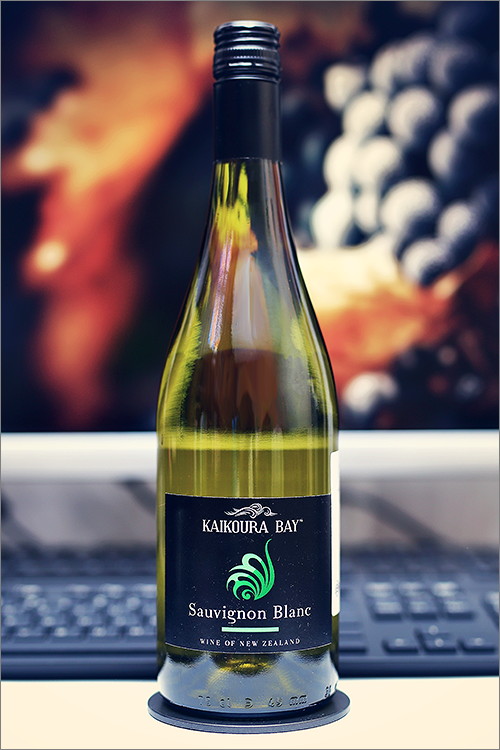 Tonight we are going to review a wine, that conquered our hearts from day one – Sauvignon Blanc Hawkes Bay 2014 from Kaikoura Bay. This is a 100% sauvignon blanc wine that impressed us with its expression of variety. This is a classic sauvignon blanc wine, as classic as sauvignon blanc can be – it comes from New Zealand, the place where this variety is now a religion. The name ‘sauvignon blanc’ translates as ‘wild white’ and guess what -this one is a wild beast indeed. What makes sauvignon blanc unique from other white varieties are its unique herbaceous flavors, like green bell pepper, jalapeño, gooseberry and fresh cut grass – these flavors come from aromatic compounds called pyrazines, but enough theory, without further ado, let’s get straight to the tasting! Pale straw yellow color with pale, white straw hues towards the rim of the glass. The nose is strong, filled mostly with citrus fruits and herbal flavours: lemon, pomelo, pineapple, lime, kiwi, mango, bergamot, orange, dragon fruit, gooseberry, passion fruit, fresh cut grass, hay, green melon, avocado, yellow mirabelle, straw grass, jasmine, yellow apple, green pear, yellow bell pepper, chalkstone and some subtle hints of cat’s pee. The wine is dry, with moderate alcohol level, high acidity and ripe tannin. It feels crisp, zesty and smooth, with a nuanced citrusy-tropical accent. This is a quite tart, ripe and refreshing wine, with a nuanced tannic accent and a firm profile. It has a good overall balance and a quite appealing minerality, as it feels extracted, nuanced and herbal, with a ripe tannic mouthfeel towards the end. It has a long finish and a velvety, crisp and zesty aftertaste. This is definitely a great Wine of New Zealand and the overall rating says the same, with 94.2 points scored it is right there, among the best wines we’ve tasted so far. Please click on the chart icon on the left in order to get to the wine rating page, where you can find all the wines we’ve tasted to date. Conclusion: this is definitely a genuine, new world sauvignon blanc wine – firm, ripe and citrusy-tropical – just a couple of months over its prime form, a wine that started its decline, therefore we would not recommend any more bottle ageing. To be honest, we would recommend this wine as an example of typicity of sauvignon blanc, especially as an exercise of immersion in the new world sauvignon blanc. For a better experience, pair this wine with dishes that are mixing herbs with tropical fruits, like for example a tropical fruit salad with sweet and spicy dressing or some pear, blue cheese and walnut salad with maple syrup vinaigrette, as this is a wine-and-food pairing that is impossible to forget. Enjoy!